Adds the ability to switch ammunition types on the fly, and a wide range of types to craft. There's everything from AP and tracer rounds to beanbag shotgun shells and homing MIRV missiles, and an extensive framework for adding your own ammo types. Plus under-barrel weapons, and adjustable zoom on scopes! Loads of Ammo - Hopper's Patch - AP ammo recipe requires steel instead of lead Needed as Hopper's patch patches it. Removed requirement for compatibility patches for ammo switch feature! Thanks Trainwiz! Thanks to FO4Edit! Thanks to Orvid for his scripting tools Caprica and Champollion! 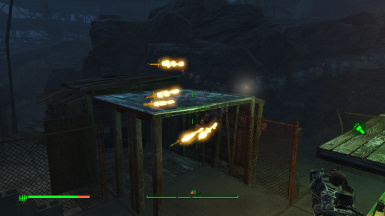 This mod sets up a framework for the ability to switch ammunition types on the fly- like in New Vegas. You can craft a wide range of ammo types, and switch between them easily. The mod adds new ammo types for (almost all) weapons- that let you lay walls of fire or radiation, knock enemies back or just switch to AP to hunt armoured foes. It also adds underslung weapons- grenade launchers and flamethrowers for the combat rifle! Pyro: Fires a blast of flame. And many more! I may even list them all when I have a spare hour. 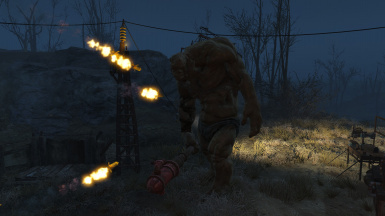 Flamethrower/Advanced Flamethrower: Fires flames! Thanks to Walterminator's resource! Grenade Launcher: Launches grenades. Multiple types! Using the mod is easy! Build an Ammunition bench, and from there build some alternate ammo. Then build one or more of the [Ammunition Switcher], [Scope Zoom] or [Secondary Weapon] items. Hotkey them, then equip them to use. All modded-in weapons are compatible thanks to TrainWiz! NPCs can use these ammo types! Switch a gun to use an alternate ammo type, and hand it to a companion (with ammo) and they'll use it. They won't yet switch back to normal ammo if they run out. 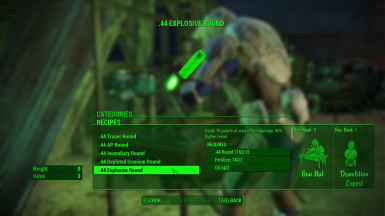 Most ammo types are compatible with most legendary effects. Ammo types that change a weapon's projectile (e.g. tracer rounds) aren't compatible with the Explosive legendary effect. 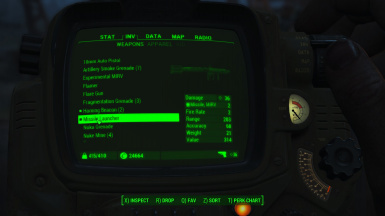 Any rechambers in modded-in weapons that use the vanilla rechamber types! Some weapon mods (e.g. rechambers into shotgun shells/railway spikes etc.) require patches to work. Any Mod, Any Weapon thanks to AceCarteria! Modded-in weapons are easily modified to be fully compatible with Loads of Ammo via the tutorial below. If you make any compatbility patches, I'll happily host them here for everyone else! I'm not averse to adding new calibres to the mod (e.g. .22). 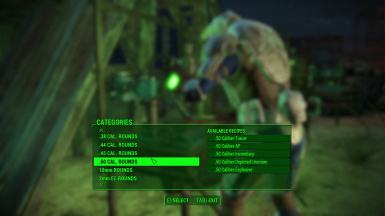 If you have made a mod that uses a new ammo type and want to make variants for it, let me know (as long as it's not too pedantic). I'm not a modeller and the hacked-together underbarrel grenade launcher is the best I can do. You can help me! slow down your fire rate, whilst the radiation exposure of depleted uranium rounds should encourage you to be faster and more reckless. makes it hard to make interesting, though- I ended up ditching the idea of hollowpoint ammo that's affected more heavily by armour too. If you have some well-thought out balance suggestions with justifications (ideally more useful than 'nerf plz' or 'Ammo Type A is too weak that's it' or 'that's not how depleted uranium rounds work' or anything with the words 'realism' or 'immersion' in), please let me know in the comments!